Varanasi, a city of spiritualism where the people are living by following their great culture and traditions. It is believed that Kashi is the most oldest city which was created by the God Shiva Himself. People, who are living in this city consider themselves great disciples of the Lord Shiva. They believe that they are blessed by God directly that’s why they have the chance to live in Varanasi. People of Kashi really enjoy and live their cultural, traditional, spiritual and intellectual beliefs in God. Varanasi is called by many names which are Kashi, Benares or Banaras. It is a worldwide famous city for its tourism and regarded as a holy city by all the Hindus, Buddhists and Jains. Varanasi is one of the oldest inhabited cities in India as well as in the world from the era of God. The culture of Varanasi is great and closely associated with the River Ganges because of the river’s religious importance. It has become a cultural and religious center in North India for years. It is the origination of the Indian classical music and most famous Indian philosophers, writers, poets as well as musicians. Banaras is most religious city in the world as Gautama Buddha has given his first sermon at Sarnath, the famous and tourists place located in Kashi. In fact the city has great scenes to see, real history to feel and sightseeing to enjoy. It is the great city in India which attracts millions of tourists every year because of its amazing places to see, sightseeing, rituals, spiritual beliefs as well as feel of comfort and calm. It is located at the bank of River Gange which blesses this city as well as its population to much extent. People are used to of bathing, meditation, yoga at the bank of the River Gange. The city serves its people and tourists with the immense love and rich natural resources. From the era, this city is referred as the city of temples, the holy city of God in India, the most religious city of India, the city of lights and learning, city of old culture and tradition and one of the oldest living cities on the earth. It has become the huge center of education as well as the classical music because of the availability of world’s best universities and academy for Indian Classical music. It is the center for celebration of the great Hindu fairs and festivals. It has become the birth place of a number of great people who had worked remarkable social work for the Varanasi as well as the India. It is not so easy to describe the Varanasi and its history in some paragraphs but it can be felt if one can think deeply. Varanasi is known as the City of Lord Shiva because it is considered as the city was created by the Hindu diety Lord Shiva before thousands of years. Varanasi city has become one of the most crowded destinations for pilgrims in India. There is a general belief that the Varanasi city stands on the “Trishool” (Trident) of Lord Shiva. Varanasi city has a lot of ghats with their religious values as it is located at the bank of the river Gange. Ghats are the most peaceful and eye-catching place to visit. People generally enjoy visiting the ghats by sitting in a boat and see ghats one by one. Ghats are the important places of ritual beliefs where people carry out ritual ablutions. Around 84 ghats at the bank of the river Ganga are welcoming the city and increase its value of attraction. Some of the most important ghats of religious importance are Assi Ghat, Dashashwamedh Ghat, Manikarnika Ghat, Tulsi Ghat, Panchganga Ghat, Harishchandra Ghat, etc. Sarnath: It is the great place where Lord Buddha had given his first sermon to his followers after getting the enlightenment. An attractive museum, Deer Park, Stupas at the Sarnath increases its beauty. Ram Nagar Fort: It is located at the other bank of the River Gange which can be easily reachable by crossing the pool. This is the huge fort of the King of Kashi known as the Kashi Naresh. Kashi Vishwanath Temple: It is the temple of the Lord Shiva Lingam which is made up of the gold and looks very dazzling. It can be visited in any season but the monsoon season has religious importance. Maha Shivaratri is celebrated here with lots of courage and joy. Sankat Mochan Temple: This is the temple of the Lord Hanuman which is crowded by the hundreds of monkeys. People read Hanuman Chalisa daily in front of the statue of the Lord Hanuman. Tulsi Manas Temple: It is the gorgeous temple of Lord Ram, Lakshman and Mata Sita, located at Durga Kund near to the Durga temple. Kaal Bhairav Temple: It is the temple of a frightful appearance of the Lord Shiva. It can be visited in any season of the year. Nepali Hindu Temple: This golden temple is built in the Nepali style at the Lalita Ghat, that’s why it is called as the Nepali Hindu Temple. Markandey Mahadev Temple: This is the temple of Lord Shiva, located at kaithi. It is considered that Lord Shiva had appeared at this place to bless a couple named Mrikandu and Marudvati. 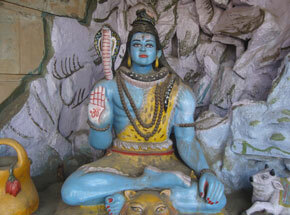 Mrityunjay Mahadev Temple: This temple is also committed to the Lord of death means Lord Shiva. A religious well with disease curing property is located here. Vyasa Temple: It is the temple of Veda Vyasa, situated at Ramnagar Varanasi. Vishalakshi Temple: It is the temple of Hindu Goddess Mata Parvati, also known as Vishalakshi Maa, placed at Meer Ghat. Tilbhandeshwar Temple: It is the temple of Lord Shiva near to the Bengal Tola Inter College. Durga Temple: This temple is famous for the Hindu Goddess Durga, located at the Durga Kund. It has the religious importance of visiting this temple in the Navratri to worship the goddess Durga. Annapurna Temple: This temple is dedicated to the Mata Annapurna, located near to the Kashi Vishwanath temple. Sankatha Temple: It is the temple of Sankatha Mata (known as the goddess of remedy) having large statue of a lion and nine planets, situated at the Sindhia Ghat. Bharat Mata Temple: This temple has a big map of India engraved in marble and known as the Bharat Mata Temple. New Vishwanath Temple: It is a grand marble temple located in the BHU campus. It is also the temple of Shiva Linga which is hugely crowded by the people whole year. Gauri Matha Temple: This is the temple of the Gauri Matha. People believe that the one must worship here before leaving the Kashi. Ganga Aarti: Ganga aarti is a great event to see in Varanasi at the Ganga ghat at each evening performed by the priests in the most stunning way. It is considered as the incomplete tour to Varanasi without seeing the Gange Aarti. Jantar Mantar: It is located next to the most famous ghat known as the Dashashwamedh Ghat. It has collection of unique equipments for the measurement purposes. Bharat Kala Bhawan: It is the museum of Art and Archeology located in the BHU campus. Saraswati Bhawan: It is located at the Ramnagar Fort having collection of religious writings, manuscripts of Tulsidas. Archaeological Museum: It is the oldest museum situated at Sarnath having great collections of antiques. Alamagir Mosque: It is located at the Panchganga Ghat which can also be visited any season of the year according to the people interest. Ashram and Math: There is a number of religious ashrams and maths in the Varanasi city with the peaceful environment and attractive surroundings. Indian Classical Music: Indian classical music was first created in Varanasi known as the Hindustani classical music. Varanasi is the originations of Indian classical music or Shastriya Sangit which is now developed throughout the northern Indian subcontinent. Bathe: Having bath at the ghats of the Gange in Varanasi has its variety of ritual beliefs and religious importance. A large crowd of the people takes bath and makes a dip in the Holy Gange water daily at the ghat. Boat rides: Boat riding is the amazing event which tourists must try particularly at sunrise and sunset. It can be started from the Dashashwamedh Ghat and end up with the Manikarnika Ghat by seeing the cremation process. Have the real joy of the nature thorough boats riding in the early morning which make us feel in our soul a deep silence, overwhelming cool climate and come close to the Supreme power. Some time the hotel, where you stay, arrange a free of charge boat rides for you for the limited time. Street and Ghats Walk: Walking in the morning at the street and ghats are also the great things to try while tour to Varanasi. Roads are clean and empty which makes walking so easy, comfort and enjoyable. Eating: There are a variety of tasty and delicious foods within budget available at every place. There are the varieties of restaurants, dharamshalas and hotels in the nearby areas of the ghats. Banarasi Khana: A delicious Banarasi khana is available at 15, 20 or 25 rupee per plate in the main market area. Dum Aloo, Aloo chat and Pani puri: These are the special dish one must try while go to Varanasi. They are very tasty and luscious with the delicious desserts. Banarasi Paan: Banarasi paan is the most famous dish having a betel nut mixture. Banarasi Lassi: It is also the most renowned dish with layers of Malai and Rabri. It can be enjoyed in the summer season. Rabri and Malai: The cup of fresh and cold rabri and malai can be enjoyed in the evening. Varanasi is the easily reachable city by all the means and well connected by all the cities through the airplane, train, bus and car. By Train: It is the easiest means to reach to the Varanasi from any city such as Delhi, Agra, Lucknow, Mumbai, Chennai, Kolkata, etc. Almost all the trains of Northern Eastern Railway (NER) pass through the Mughal Sarai Junction that is just 17 kilometer from the Varanasi Junction. However Varanasi Junction itself is a huge station and almost all major trains go to Varanasi Junction. By Bus: Buses are also the convenient means of traveling to the Varanasi from the nearest city. You can choose buses of the state government or private buses. By Air: The city has an International Airport which makes the traveling through the plane very convenient. Some of the special flights are Indian Airlines, Jet Airways/JetLite and SpiceJet which provides best transport services.